NY Yankees pitcher Mariano Rivera may have a fabulous right arm, but his voice was not exactly golden. He apparently had vocal cord polyps that resulted in a progressively raspy voice. Read the NY Post article. On Dec 2, 2011, he underwent surgery to get them removed and if he now sticks to an appropriate voice therapy program, his voice should essentially revert completely back to normal! Watch the video to see what vocal cord surgery looks like. There are MANY theories as to how vocal cord polyps as well as other similar vocal abnormalities like cysts and nodules form. However, one theory that seems to make the most sense to me deals with how the vocal cord heals after a phono-traumatic event like screaming or yelling... something I'm sure Mr. Rivera routinely performs during baseball games. 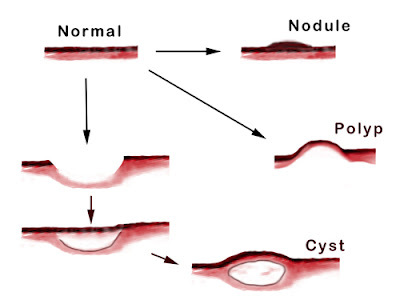 To differentiate among the various benign vocal cord masses, consider a cyst which is formed when the mucosal vocal cord lining breaks down and during the healing process a cyst develops due to entrapped cells meant for creating lining. A polyp, however, is in essence a blistering of the vocal cord lining. Vocal cord nodule for comparison's sake is just callous thickening of the vocal cord lining that occurs over time. A vocal cord cyst is like a sebaceous cyst that commonly occurs under the skin of the face or neck (a pimple, but no opening to the surface). A vocal cord polyp is like a blister that forms on the hand if you shovel dirt too much. A vocal cord nodule is like a callous that forms after prolonged repetitive skin trauma (like callous on the hands after shoveling dirt for years). Read more about vocal cord cysts, polyps, and nodules!